“Aquitas has a lot to offer to the Maximo community this year beyond our core Maximo software and services offerings,” commented Maddy Hawkins, Director of Marketing at Aquitas Solutions. She added, "The launch of our Connected Maintenance solution earlier this year was a game changer..."
Aquitas Solutions, a leading provider of Enterprise Asset Management (EAM) and IoT solutions that optimize asset intensive industries, announced today that they will be a Platinum Sponsor at MaximoWorld 2018, August 7-9, in Orlando, FL. 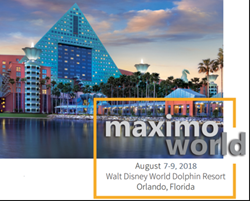 The event, driven by Reliabilityweb.com, is the largest cross-industry gathering of Maximo and Asset Management professionals with a single goal in mind: to share their Maximo knowledge and improve the use and capabilities of Maximo. This year’s conference will also focus on how IoT and Artificial Intelligence (AI) are transforming asset management, including a technology showcase on Thursday that will feature Aquitas’ Connected Maintenance solution. Aquitas customers will also be active on the MaximoWorld agenda, including Leprino Foods and Skookum Contract Services, who will be presenting at various breakout and panel sessions. Aquitas will have several Maximo and IoT experts on hand to meet the needs of all attendees, including Director of Development, Michael Hayes, who will be conducting live demos of the Connected Maintenance solution at our booth in the expo hall throughout the three-day conference. Based in Atlanta, GA, Aquitas’ leadership team and management consultants have nearly one thousand man years of enterprise asset management experience and have been early adopters of IoT technology that helps clients leverage their EAM system to optimize performance and improve productivity and service levels across the entire spectrum of their organization. The Company has a long history of delivering faster, smarter, and more agile solutions at a competitive rate helping customers streamline their internal processes and compete more efficiently in an increasingly synergetic world.